You hear a lot about driverless cars these days, but the truth is, they have a lot of hurdles to overcome before one will be rolling up to your front door to pick you up. One hurdle is public opinion, with a AAA survey showing that 68 percent of baby boomers and even 49 percent of millennials are scared to ride in one. That fear is rational enough, considering that the vehicles currently being tested still have trouble handling unexpected conditions, such as snow-covered roads. There are also ethical dilemmas, such as how the piloting software should choose between injuring the driver and injuring a pedestrian. And as with most new technologies, privacy could also be a real issue. Despite all those challenges, self-driving cars are coming. Research firm IHS Automotive has predicted that there will be as many as 54 million of them on U.S. roads by 2035. When that happens, will you be better or worse off financially? There are a lot of ways that driverless cars could affect your bottom line. Once all cars on the road are driverless, car accidents are expected to decline — in fact, consulting firm KPMG predicts a 90 percent reduction in crashes by 2050. And any accidents that happen would be the fault of malfunctioning hardware, not user error — and therefore the manufacturer's responsibility. KPMG predicts these changes will shrink the auto insurance sector by 71 percent. Even in the short term, while people are still buying auto insurance, they are likely to reduce or drop their liability coverage as the liability shifts to the manufacturer. The first cars to be autonomous will likely be high-end brands, such as Ferrari, Audi, and of course, Tesla. That adds quite a bit of sticker shock on its own. On top of that, the self-driving technology is expected to add between $7,000 and $10,000 to a car's price in 2025; by 2035, the differential will shrink to $3,000, IHS Automotive predicts. The gravest costs of drunken driving are human lives: Over 10,000 people die every year because someone got behind the wheel intoxicated, according to the Centers for Disease Control and Prevention. But there are also steep financial costs, even if you don't get into a crash. A national survey by Nolo put the average cost of a first-time DUI arrest at $6,500 to cover costs such as the ticket, towing, bail, attorney, increase in insurance rates, and other expenses. That doesn't include lost wages, which can amount to thousands more. Once fully self-driving cars are safe and legal, owning one would be one way to avoid ever driving drunk. But even before mass adoption, on-demand self-driving vehicles might become a popular and affordable way to get home from the bars. Best of all, no Lyft driver will have to listen to your long-winded drunken stories. Other tickets for moving violations, such as speeding or blowing a red light, could also become a thing of the past and save you hundreds (especially if you have a lead foot). The drunken driving scenario above might be great for people who need sober rides, but not so great for those who make a living driving people home from bars. Taxi and ride-share drivers wouldn't be the only workers impacted. The 2017 launch of Uber Freight was a warning shot for truck drivers. Goldman Sachs estimates that, 25 years from now, automation could eliminate 300,000 trucking jobs a year. While the cost of owning an autonomous vehicle may be prohibitive for most disabled people at first, the technology could be a boon for cities that must provide paratransit services under the American Disabilities Act. In many cities, these services are inefficiently run. New York, for example, spends an average $71 per trip transporting elderly and disabled people who can't ride the subway or public buses; studies estimate that this system is wasting up to $100 million a year. If cities invest in driverless vans and cars to pick up those passengers who don't need human assistance, it could save millions. That could possibly lead to lower taxes or subway fares for other citizens. Disabled people who can afford it will probably be early adopters of privately-owned driverless cars as well. They might not even be more expensive than the current options, since converted vehicles with hands-only controls and other accessible features, for instance, can cost more than $50,000. Since Americans spend 75 billion hours a year driving, just imagine how much more you could get done if you could work while your car drives you around. Morgan Stanley predicts driverless cars could result in more than $500 billion in U.S. productivity gains. Whether you personally or your employer will enjoy the bulk of those gains depends on how things play out. If you are self employed, you could really unlock earnings potential. If you don't want to spend your commute working, that's fine too. You'll have more time to catch up on a good book or even a nap. A 2015 University of Michigan study suggests that autonomous vehicles could decrease car ownership by 43 percent, from 2.1 to 1.2 vehicles per household. The theory is that an autonomous vehicle could drop off one family member, and return home empty to be ready to transport others, instead of sitting idle in office parking lots. Another way that self-driving cars might reduce ownership is through growth in ride-hailing services. Already, younger adults are more likely to feel they don't need a car because they can always get an Uber. If technology makes those services cheaper and more ubiquitous, that sentiment is sure to grow. Avoiding a vehicle purchase would save the average family more than $8,000 a year, according to AAA's total cost of ownership figures. 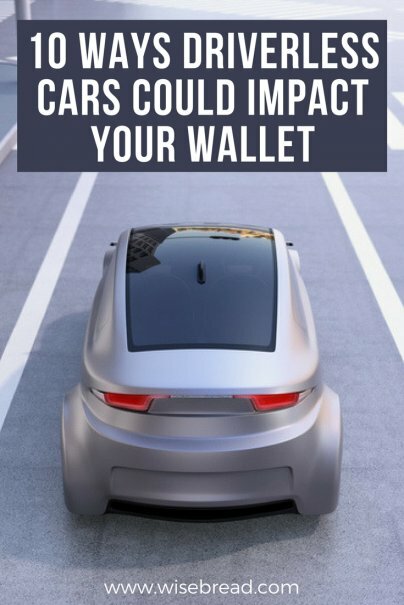 Whether your car drops you off and returns to your home garage, or you rely on automated shared vehicles, you likely won't have to waste time and money on parking any more. Imagine never having to feed a meter, pay a parking ticket or a towing fee, or circle endlessly looking for a spot. The average American wastes $345 a year in fuel costs, lost time, and emissions just looking for parking, according to INRIX Research. Many parents of young teens who could safely stay home alone end up hiring sitters just to pick them up from school, drive them to soccer practice, etc. If these kids could hop into a self-driving car instead, many families could drop their after-school sitter and save hundreds of dollars a week.